Five generations of Radkes have nurtured and tended to the family farm. In the 1870s Gustave Radtke came to America from Prussia (Germany). By the late 1880s he owned a farm that was over 80 acres. He and his wife Paulina used the land as a general farm. They raised five children on the farm including their oldest son Friederich Wilhelm. In 1914, Gustave passed away and the farm was divided with Friedrich receiving the 40 acres the current orchard and woods sit on. Friedrich and his wife Jesse continued to farm this land with the help of their three sons and three daughters. They grew a variety of fruit and vegetables and sold these from a roadside stand. When Friedrich was killed in an automobile accident in 1951, the farm was passed on to his son Frederick Leroy. Fred and his wife Gladys worked hard to keep the farm going. At one point the farm was largely a chicken farm. A few of the original chicken coops are still standing. 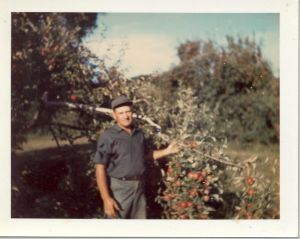 Fred also grew apples, pears, peaches strawberries, peppers, and his beloved tomatoes along with a large assortment of other vegetables all with the help of his wife and two sons Randy and Denny. The family maintained a greenhouse to sell plants in the spring and sold fruits and vegetables in the summer and fall. Randy and Denny were often sent door to door peddling fruit and vegetables. During this time the Radkes sold their apples wholesale and special order. During the 1980s and 1990s the farm shifted to a solely U-Pick operation. Sadly in 2000, Fred passed away and the farm moved on to the next generation. Randy and Denny have continued to run the orchard along with planting new varieties of apples and dwarf trees which are more U-Pick friendly. In recent years, their children have begun to help with the orchard. This new generation has developed a website and mailing list to better connect visitors to the orchard. Over the years many school groups have faithful visited the orchard to learn about farming and nature. Many families have been coming to the orchard for generations. The Radke family is pleased that the orchard, such an integral part of our history, has become a family tradition for so many other families.